Bio: The talent behind the website is Chef Phil, a graduate of The French Culinary Institute’s Classic Culinary Arts and Restaurant Management Programs. Chef Phil’s lifetime love of food and his desire to share that passion for food with others has helped to create this site, where people can come to learn to cook delicious food under the guidance of Chef Phil’s and others’ considerable expertise. Our aim is to take the mystification out of cooking and to get you to have fun in the kitchen through your success! 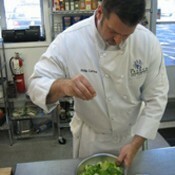 We can’t wait to start helping you make a difference in the outcomes of your cooking!